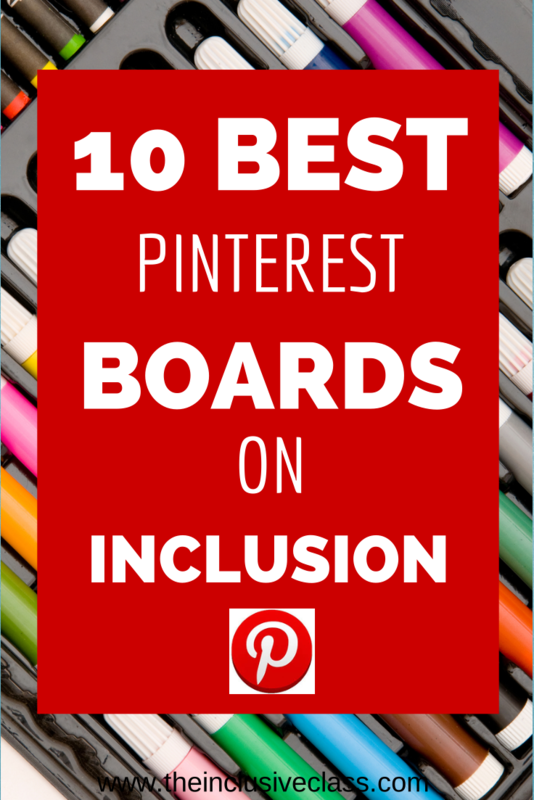 As Pinterest becomes a popular way for teachers to share and find resources for their classroom, I would like to give you a list of my favorite Inclusion boards! 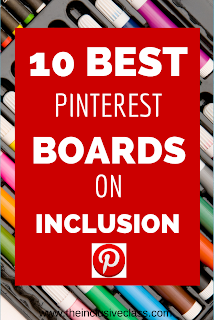 The number of boards dedicated to inclusive education is growing daily and I’m sure I have missed out on some very noteworthy mentions. For that reason, please let me know in the comment section below, of any pinners or boards that you find very helpful. 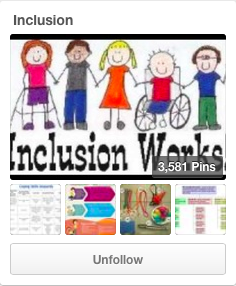 However, for the time being you can’t go wrong following these Pinterest boards, where you will find so many ways to enrich and enhance your inclusive classroom! information for all age levels here. Give yourself a lot of time to look through it! 2. Lisa Friedman - Lisa’s Inclusion board is a collaborative board where several inclusion advocates (including The Inclusive Class) pin their favorites in one place. You will see a variety of pins here, including blog posts and articles that make you think about inclusive practice. 3. Melina Nafarrate - This board is focused on inclusion in the early years. Melina pins ideas for hands-on activities, books and classroom management. 4. Ariel Glassman - Ariel's board has over 700 pins with a combination of inclusive activities, information about special needs, practical ideas and quotes. Although many of the pins are geared towards the elementary years, some can be adapted for middle and high school. 5. Brookes Publishing - Brookes is a leading publisher of books about inclusive education. Therefore, most of the pins on this board are books about inclusion that Brookes has published. It’s a great board to help you keep up with hot topics in inclusive education and recent research. 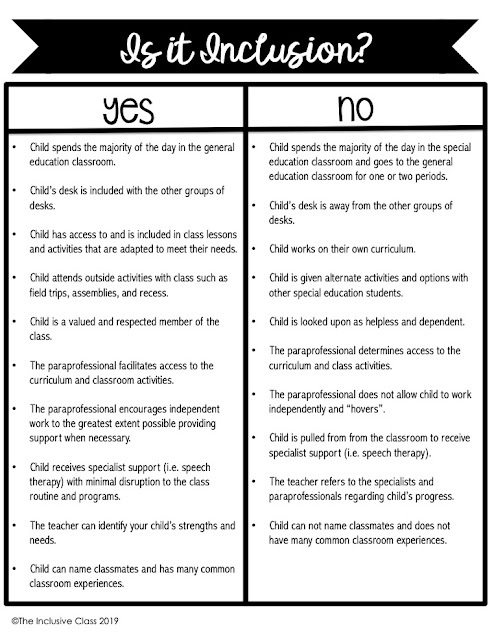 documents that an inclusion teacher needs. 7. Whitney Fazier - Numerous charts and visuals that can used in the inclusive classroom are the highlight of this inclusion board. There are ideas and suggestions that can be used in both elementary and middle school classrooms. Since many learners need visual supports, this board will be useful for any teacher. 8. Glitter Apples - As the title of this board indicates (Special Needs and Inclusion), it has pins about special needs as well as inclusion. Close to 500 pins describe various learning disabilities, physical, developmental and neurological issues. This is a fantastic resource for any inclusion teacher to refer to when planning for lessons and support in the classroom. that elementary teachers will find very helpful when planning inclusive lessons that meet Common Core expectations. Hand-outs, lesson plans, and activities line this board. 10. 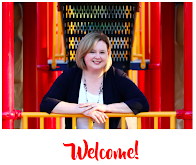 Kathleen McKlaskey - Kathleen is known for her resources and knowledge of technology to support learning and “level the playing field”. On this board, she has numerous pins with suggestions for apps that can be used for special learners. Save yourself some time and refer to Kathleen’s board when looking for educational apps in your classroom! Do you have any boards to add to this list? Leave a comment below! 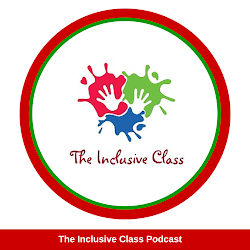 Don't forget to follow The Inclusive Class on Facebook/Twitter/Pinterest for more resources about inclusive education!